On the day after Christmas, Tom and I divided our trip home to North Carolina from New Hampshire with a stop at our home town of Milford, Ct. Since our move to NC in late 2015, we had only driven through on our way to other destinations, and it was time to visit not only our town, but our dear friend Janie Merola. (More about Janie below.) Our first stop was to visit the cemetery where our parents are buried and to place two arrangements I made from trimmings from our Christmas tree and mountain laurel branches from our property. 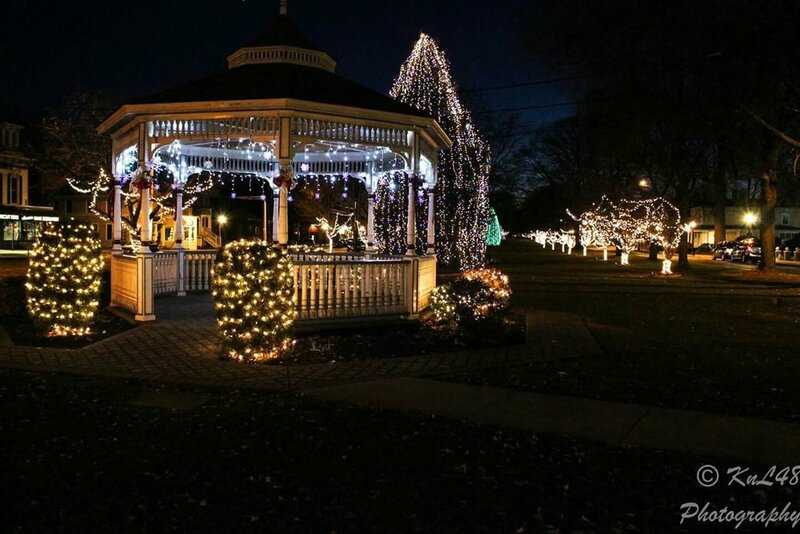 After a great dinner with Janie and three other dear friends, we decided to take a walk through downtown Milford and Milford Harbor. This photo by Ken D’Ademo, was much better than the one I took while dashing across the green! On another “historical” note, this is the same green where I met Sue Hebert, who was demonstrating weaving in a craft show, and who later taught me to weave! Rounding out our unparalleled quality of life is a strong retail community that provides shoppers with all aspects of consumer goods. From the mall to the varied and diverse shopping opportunities of our small retailers-we sell it all. Boasting an ever-expanding automobile row, furniture stores, specialty shops, restaurants and hotels, ready to fulfill all types of consumer requirements. A diversified economy supports manufacturing, retail, corporate office, and a service industry. Unemployment is at an all-time low. Home to manufacturers of consumer products, fabricated metals, plastics, as well as dot.com, investment, and hi-tech firms, Milford welcomes all to its corporate, research and industrial parks. February 1, 1639, is the date the area then known as "Wepawaug" was purchased from Ansantawae, chief sachem of the Paugusset Tribe. Settlers began arriving shortly thereafter and began to build the town known as Milford. Townspeople played a part in the development of the United States. Adventurers from Milford reached out and founded several other communities and explored afar. Buried treasure is said to exist on a small island the Indians called "Poquahaug", just a mile off Silver Sands Beach. It is a recognized fact that Captain Kidd and other pirates sailed and hid along the Connecticut coast. It’s no wonder that iron chests filled with "loot" are rumored to be buried on the land called Charles Island! Three governors of Connecticut called Milford their home. Fort Trumbull was built to provide protection in the late 1700s during the Revolutionary War. Yes, George Washington dined and rested here! 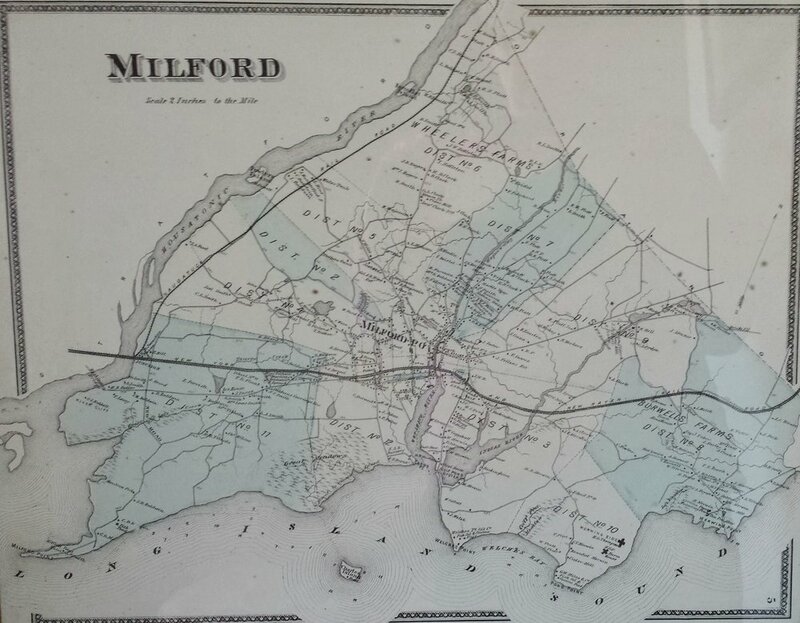 During the Civil War, Milford was a stop on the Underground Railroad. Although primarily agrarian, shipbuilding, oystering, small industry and trade on the open seas from the harbor were part of the local economy. The early 1900's brought the leather industry along with the making of boots, hats and shoes. Milford was also famous for carriages, which were sold throughout the centuries. After World War II, the population swelled as GIs returned from the war and bought houses in the suburb of New Haven and Bridgeport called Milford. Industry also developed to support the war effort. Norden, Milford Rivet, U.S. Motors, and Edgecomb Steel were some of the familiar names of the time. Other industry followed most notably the consumer giants of Bic and Schick. Then the completion of I-95 in 1960, with its seven exits and entrances brought easy access. The Connecticut Post Shopping Center and other development followed rapidly. Development reached a peak in the 70s and 80s, leveled off in the early 90s and then picked up again in the late 90s until we reached our present population of over 52,000 and businesses that number over 2,000. The Milford Historical Society safeguards three 18th century homes at its Wharf Lane Complex. Among their possessions is one of the finest collections of Native American artifacts. Below, a framed painting and early map that hang in our guest room. A walk past the harbor where the empty docks await warmer weather and boats to be placed back in their slips.